Tight and heavy, just the way we like it! Totally rockin’ debut. As a shred-minded musician, who wouldn’t be predisposed to like an album named Time to Burn? But unlike that classic Giant recording, Taking Dawn sit squarely in the style of other classic ‘80s rock bands like Skid Row, Firehouse, Bon Jovi, Honeymoon Suite, and fellow Las Vegas natives, Slaughter. Thank god this isn’t another Vegas band sounding like the Killers or Panic at the Disco! This isn’t a retro recording, though. Taking Dawn have a modern metal sound, evident in the sound of the guitars and the vocal production… and upon listen to the grooves in songs like “Godless,” it’s clear that today’s modern rock vibe hasn’t been completely lost on these four guys: Chris Babbitt (vocals/guitars), Mikey Cross (guitars), Andrew Cushing (bass), and Alan Doucette (drums). Thankfully, they avoid screamo crap in favor of actual singing and big gang vocal choruses. The songs are almost all up-tempo, rocking right from the start with the title track. And sure, there are some badges worn proudly, as the band channels Bon Jovi’s “Runaway” on “Take Me Away” and they pay respect to the Crüe’s “Kickstart My Heart” on “Fight ‘Em With Your Rock.” We expect that the anthem “Never Enough” will have entire arenas screaming along with the band. There’s a hard rock guitar-fest going on all over Time to Burn, and Chris and Mikey deliver a ton of dual lead melody lines throughout. Mikey is responsible for plenty of other lead work, and mostly just makes use of wah as his effect of choice (unless some of those leads are courtesy of a harmonizer effect). The rhythm section is solid and pounding with driving eighth-note grooves that are typical for the genre. If there’s one CD to make you drive your car way too fast this summer and get a little rebellious with your attitude, pick this one up and get ready to rock. Hard. Back in the early days of MTV (when they actually played music videos), Triumph enjoyed a heavy rotation as well as a feature on the channel’s Saturday Night Concert series. It was via this new medium that many (including this reviewer) were first introduced to Triumph – Canada’s other rock trio! When Greatest Hits Remixed arrived at our offices for review, as a life-long fan of the band, I was keen to check it out, for the simple reason that a definitive greatest hits package fills a void in their otherwise excellent catalog. More than just a few familiar songs slapped together, the package also includes a DVD compiling some of their best-known videos, some hand-held cam “bootleg” footage and their induction into the Hall of Fame. The CD features fourteen songs – more accurately 13 classics and one bonus track, “Love Hurts,” the latter included for inexplicable reasons as far as I am concerned, mainly due to the fact that Nazareth sealed the deal in regards to the definitive cover version, not to mention the song is pure cheese. Each track was completely remixed from the master multi-tracks, which immediately conjures up images of extended dance mixes and other abominations, but fear not – the intention here was to update the sound, not to create any history-altering soundscapes. The result to my ears is a mixed bag, unfortunately. From a fidelity standpoint, the result is phenomenal. The mixes are big and loud and superior in every way to the original releases. However, too much tinkering with the mix has taken place, specifically in the area of vocal effects and reverb-laden drums. The former is most noticeable on the classic “Magic Power” and the latter on the also-classic “Fight the Good Fight.” So much reverb has been applied to the drums they sound at best like something you would hear on a Kingdom Come record and at worst, like cardboard. Also, some alternate vocal takes have been used (the disc’s opener “Allied Forces,” for example) making my initial moments of listening to this disc a jarring experience to say the least. Another oddity is the strange omission of “Say Goodbye,” which was certainly one of their more commercially accessible songs as well as one of those aforementioned videos in heavy early MTV rotation. Fortunately, there are some big plusses to outweigh the minuses – Rik Emmet’s guitar, especially his solos, are brought way up in the mix, so much so that you can even hear the sound of his pick on the strings! The DVD is almost worth the price of admission alone, piecing together many (but not all) of those great videos you haven’t seen since the days of leg warmers and parachute pants! And finally, the package is rounded out with a well-written and informative booklet that also includes lyrics to all of the songs contained on the disc. At the risk of sounding contradictory, even though I wasn’t crazy about all of the remixes, I still would not dissuade any fan, new or old, from purchasing this collection. New fans won’t even notice the remixing, old fans will want it just to complete their collection, and every fan will enjoy the DVD. Holy turn back the clock! Right from the opening gang vocal of “Do Ya Wanna Taste It” to the children’s choir in “Chasing Rainbows,” we knew this record would be an ‘80s glam lover’s dream (or worst nightware). Norway’s Wig Wam wears their musical influences proudly on their sleeves — and maybe tattooed proudly across their biceps! The music is a catchy and melodic blend of Mötley Crüe-meets-Poison with a splash of Def Leppard and The Scorpions thrown in. Bass player Flash is responsible for the Nikki Sixx vibe, while drummer Sporty sounds and plays (regrettably) like Rikki Rocket. Guitar player Teeny has a bigger sound than his name suggests, and although he doesn’t stand out technique-wise like our favorite Scandinavian guitar gods, his style tastefully combines much that we’ve come to appreciate from classic Los Angeles and European glam bands. Vocalist Glam could replace Cinderella’s Tom Keifer mid-tour and nobody would know the difference — his voice is very similar, though on songs like “All You Wanted” you might mistake him for Klaus Meine. There are great guitar melodies and tight rhythms, big chorus vocals, fists-in-the-air anthems, and lyrics that don’t require serious concentration. Overall, there’s not a weak song on the entire CD. Our only complaint is in the drums department. For an otherwise well-produced CD, we were disappointed by the sound of Sporty’s drums — they sound like crappy ‘80s electronic drums. Is the guy still playing an old Simmons kit? The kick drum and snare are completely devoid of dynamics (not to mention acoustic drum tone), and with their prominence in the mix, those horribly dated sounds punch through with alarming clarity and ruin the listening experience for us. If you can hear beyond the retro drums, this is a decent glam experience worth checking out. The most definitive Marillion collection ever! 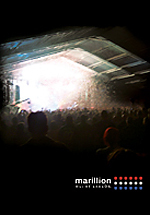 Marillion have a long history both as a band and also for producing outstanding concert DVDs. And while all the recent videos excel in terms of quality of the performances and the audio/video production, none of them captures the band to the same degree that this three-DVD set accomplishes. Shot over the course of 2009’s Marillion Weekend in Holland, three evenings of concerts were captured in beautiful high definition, and long-time fans of the band will love this collection of over six hours worth of music material — it contains plenty of Fish-era material as well as a great mix of everything else, including many songs that we haven’t seen the band perform regularly in concert in at least a decade. DVD #1 from opening night features the band performing their classic album Seasons End in its entirety, followed by five tracks from the more recent Happiness is the Road. At each convention (held every other year), the band chooses one of their old albums to play from start to finish, and Seasons End holds a special place in the hearts of Marillion fans. Besides being the first album to feature vocalist Steve Hogarth, it contains some of the band’s most memorable tracks such as “Easter,” “The Uninvited Guest,” and of course the radio single “Hooks In You,” without which it might have been years before I ever discovered the band. There’s even a short bonus reel on this DVD containing some behind-the-scenes photos and video clips (without commentary). Night two of the weekend, DVD #2, features an assortment of songs going back to 1981. Highlights range from “This Train is my Life,” “A Legacy,” and “Estonia” to “Cover My Eyes,” and “Garden Party.” But really, what’s a highlight when you love virtually everything in their catalog prior to, say, 2007? The final evening, DVD #3, opens with the beautiful “A Few Words For The Dead,” rocks on with “This Town,” and later includes fantastic versions of “Kayleigh,” “Lavender,” and “Heart of Lothian.” To our ears, classic Fish-era Marillion sounds much better with Hogarth on the mic, though I’m sure some fans would go to war with us over saying such a thing. “The Invisible Man” is another favorite track of ours from this evening’s concert. At a fan-focused weekend event like this, audience participation was absolutely crazy. There were a few songs where we wondered if Steve Hogarth was going to sing even a single line — the audience was so intent on providing the lead vocals! The band was in top form throughout the weekend. They keep getting better with age, which not all bands can aspire to, and it seemed like bassist Pete Trewavas and keyboardist Mark Kelly sang more vocal harmonies overall than on previous tours. Guitarist Steve Rothery had his complete “everything but the sink” guitar rig in play for these shows — the classic Roland Jazz Chorus stuff as well as his newer Groove Tubes tube gear (see our previous interviews with Steve if you’re a gear nut like us). His performance was spot on as usual, as was drummer Ian Mosley, who seems like he could stand to be pushed a bit harder on the next record… he just makes it all look too easy and relaxed while the other guys are sometimes busy concentrating on playing five parts apiece, all at once. Although Hogarth played his famous cricket bat-turned-MIDI-controller, it would have been cool to see him put on the MIDI gloves, too. But hey, we’re nitpicking about nothing. This is an amazing collection of music from a band that shows no signs of slowing down, and new fans just discovering the band will get a great picture of why these guys are so highly praised. If you’re not the concert DVD type, you can also get a lot of this weekend’s music in CD format from Marillion’s website. Oh, hey… we actually do have one negative comment to pose: when is Marillion going to start releasing concert DVDs on Blu-Ray? OK, enough said. You probably ordered this online before you even finished reading the review. How sweet it is — Murder rocks the modern metal sound. From the start of The Murder of My Sweet’s opening track, “No Evil,” we were instantly drawn into this Swedish quintet’s beautiful symphonic metal. Fans of Nightwish or Evanescence will be immediately at home with the sound and style, but The Murder of My Sweet manages to distinguish themselves with some special finishing touches. The musicianship is fantastic throughout. Guitar work from Daniel Palmqvist and orchestral keyboard work from Andreas Lindahl share center stage on most songs, while bassist Johan Niemann and drummer Daniel Flores provide the appropriate and pounding rhythm section, complete with tastefully executed double kick bombast. Flores, who not only arranged the orchestration, but also produced, recorded, and mixed Divanity, deserves special recognition for the outstanding production work. Having a big keyboard sound that doesn’t take away from even bigger heavy guitars is no easy feat, and the acoustic guitars sound equally pristine. Throw in all the orchestration and big vocal harmonies, add a few short electronic music sections here and there, don’t over compress it, and you’ve got a great mix that takes the listener on a roller coaster journey — as it should! Lead vocalist Angelica Rylin is a great discovery. You can’t deliver music like this without an incredibly gifted vocalist, and Rylin rocks with passion throughout the album, from up-tempo and angry tunes through haunting ballads. Although she breaks no specific ground style-wise, Rylin delivers beautiful, powerful vocals across a variety of rock styles that most typical singers will have quite a challenge trying to cop. The guitar and keyboard solos in tracks like “Revolution” provide beautiful illustrations of Palmqvist and Lindahl’s chops — precise, technical soloing both apart and in harmony with each other. Skipping ahead to the final song on Divanity, the seven-plus minute epic “Death of a Movie Star,” is a real treat. There is no denying any of the talent within this band, and on this progressive-tinged song, they delve into numerous styles and deliver some fantastic Queen “Bohemian Rhapsody”-worthy choral harmonies. This song alone is worth the price of admission, and it’s just icing on top of a very yummy Swedish cake. No meatballs here.